With dozens of millions of visitors per month, Rapidgator is one of the most used file-sharing sites. Looking ahead, the site's CEO now has even bigger plans. The Russian entrepreneur is heading a new blockchain-powered data storage marketplace and is hoping to raise up to $50 million through a token sale. 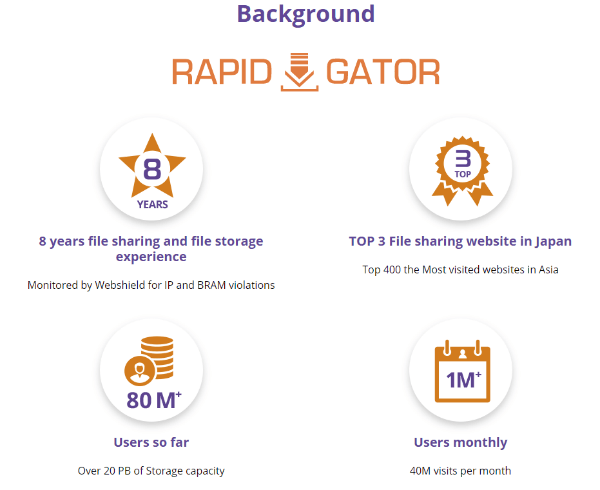 For several years, Rapidgator has been one of the leading file-sharing sites on the Internet. While Rapidgator’s functionality hasn’t drastically changed in recent years, the site’s CEO has been working on an ambitious new project. This month, he’s introducing their blockchain powered file-sharing and distribution platform Market.space to the world. Generally speaking, we’re not too eager to cover ICOs and new cryptocurrencies but with a major file-sharing player getting involved, we decided to take a closer look. Simply speaking, the new platform will act as a hosting aggregator. Professional hosting services can offer their unused capacity, creating a market where consumers can pick the option that’s best for them, with bulletproof anonymity. Decentralized file-storage services are not new by any means. Platforms such as Filecoin and Storj.io have been around for a while, so how does Market.space differentiate itself? According to Rapidgator’s operator and CEO, Alex Rakhmanov, Market.space will focus on partnerships with large professional hosting companies. This as opposed to storing content on computers of the public. “Market.space will be booking.com for storage where the customer can select the best location for his storage and the lowest price,” Rakhmanov says. On the demand side, the audience can be quite diverse, ranging from companies who need a file-storage solution to artists or scientists who want to share their data. The technical details and fine print of the plan are spelled out in the whitepaper, although it’s hard to judge a project without being able to try a working version. The most interesting part to us, at this point, is the link to Rapidgator, which is publicly promoted. The Market.space website highlights the CEO and mentions Rapidgator as an established file-sharing platform with a storage capacity of more than 20 Petabytes and 40 million visitors per month. Although that’s a testament to its file-sharing expertise, critics are likely to point out the piracy label copyright holders have applied to the site over the years. While the site can be used to share any type of file, it has often been criticized as a piracy haven. Earlier this year, the site was also featured on the US Trade Representative’s list of notorious markets. These characterizations are not new, but Rapidgator’s CEO categorically refutes the claims. “Rapidgator is a highly acclaimed file-sharing website, with an established technology behind it. We comply with the DMCA and remove files when they are reported,” Rakhmanov tells TorrentFreak. He stresses that Rapidgator currently works with major industry players such as IFPI, who have direct access to their takedown tools. Market.space will also comply with DMCA takedown notices, although this isn’t expected to be a major issue. “As for market.space it is more a business to business model. I don’t think there will be any copyright issues,” Rakhmanov says. “Still, we’ll have to register the new project for DMCA purposes and remove files if they are reported. If a report is false, the user can send a counternotice and restore it,” he adds. Market.space’s token sale, which will various tokens including SIA and Storj, starts on April 16. The ICO has a hard cap of $50 million, and a minimum of $15 million is required to get the project off the ground.